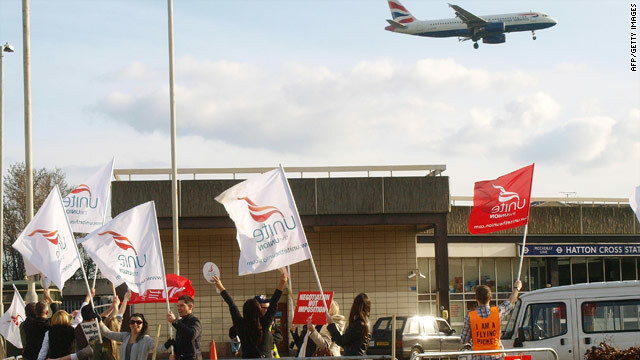 London, England (CNN) -- British Airways cabin crews were set to start a second wave of strikes at midnight Friday over the airline's planned changes to pay and working conditions. The strike, set to last for four days, follows a three-day strike last weekend. BA said Friday it will be able to fly more than 75 percent of customers booked to fly during the upcoming strike because so many staff are willing to cross the picket lines. Another 18 percent of passengers are booked to fly on other carriers or have changed their travel dates to avoid the strike, the airline said. "The vast majority of British Airways staff, including thousands of cabin crew, are pulling together to serve our customers and keep our flag flying," BA Chief Executive Willie Walsh said. He added that he's sorry for those customers whose plans were disrupted because of the union's "completely unjustified action." "The strike has affected the Easter holiday plans of thousands of hard-working people," he said. BA said Wednesday it expanded its schedules to run more weekend flights because more staff are willing to cross the picket lines. The airline said it will be able to run a full operation from London's Gatwick and City airports. At London's Heathrow Airport, BA will be able to run up to 55 percent of its short-haul flights and up to 70 percent of its long-haul flights. Will you be hit by this weekend's BA strike? To help run as many flights as possible, BA is leasing as many as 11 aircraft with pilots and crews from six airlines, BA said. The British carrier made good on its threat Wednesday and stripped striking cabin crew members of their travel perks, which include free and heavily discounted travel. Walsh had threatened last week to take away the travel perks, which may have been one reason why some union staff agreed to work despite the strike last weekend. He said the travel perks are not in the crews' contracts and can be withdrawn at the airline's discretion. The union representing the striking workers called the move "vindictive" and said restoring those perks must be part of any deal to end the strike. "The withdrawal of travel concessions from crew who have been on strike represents unacceptable anti-union bullying," Unite joint leaders Derek Simpson and Tony Woodley wrote in a letter to members. "Any agreement to end this dispute must and will include a framework for the full restoration of those travel concessions." Meanwhile, fellow UK carrier BMI said Friday it had added 4,500 seats to its normal Heathrow flight schedule to help BA customers affected by the strike. BMI flies to Europe and the Middle East and is the second-largest airline at Heathrow. Budget airline Ryanair offered special fares to BA passengers affected by this weekend's strikes. BA says the changes will save the company more than $90 million a year. Unite has said the plans, which call for longer work hours and less staffing, will damage customer service and the BA brand. Stock analysts have said BA has made clear it sees the action not only as a matter of money but who will run the airline -- management or the union.